A lifelong fan returns to Atlanta in search of the city's "third team"
I was 20 minutes late. One of the byproducts of moving away from the city you were raised in is that with each visit, things become less and less familiar. New buildings are constantly being erected at an alarming rate. Familiar streets are now named after civil rights leaders’ cousins’ hairdressers. And that autopilot feeling of always ending up at your destination vanishes, with westbound wrong turns down one-way eastbound streets, and the constant embarrassment of relying on the already confusing iPhone Apple Maps feature in your own city. This was the case as I wove through downtown Atlanta, chugging coffee, searching for the side street media entrance of Philips Arena, home of the Atlanta Hawks, by 10 a.m. on a Saturday morning in October. Upon finally finding my way and convincing an attendant to let me park, lacking a single credential, I walked right into a team shootaround, open only to players, coaches, staffers, and now, me. Of the 50 people in the gym, I was one of three or four not wearing Hawks gear. My outermost attire: a Braves jacket. An hour earlier, pre-coffee, this decision seemed like a great idea — a Hawks T-shirt might be a bit much, but after a few awkward glances from those in Philips, maybe the city’s “other other” team wasn’t the smartest way to go. Bad form or not, I wanted my first impression to be that of a hometown kid arriving from New York City in peace. Even if they hated me, that much was clear. The team, dressed in an assortment of early-morning, non-scrimmage-worthy outfits — from the sweatshirt-under-the-jersey look donned by Ivan Johnson to the popular cut-off-below-the-knee sweatpants look of Anthony Morrow, Lou Williams, DeShawn Stevenson, and Devin Harris — robotically walked through an assortment of set plays, a common practice for a morning shootaround on game day. As the sight reminded me of early-morning high school basketball practice, my eyes couldn’t help but wander around the empty arena that I had been in so many times, and eventually toward the lonely rafters. 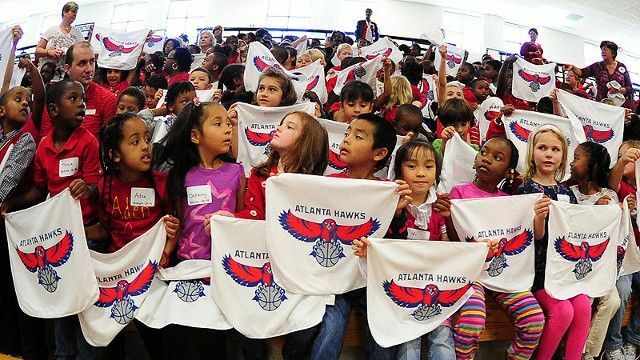 The Hawks came to Atlanta in 1968, some 45 years ago, and the franchise has managed to raise just three jerseys to the ceiling: Bob Pettit, Lou Hudson, and Dominique Wilkins. That’s it. An optimist might attribute that to retirement selectivity within the organization. But a pessimistic, cynical realist like myself looks up and immediately questions the history of one of the most struggle-filled franchises in professional sports. The “Dominique Era,” in Hawks terms, was the brightest spot. Yes, the Hawks were a contender then, posting four consecutive 50-plus-win seasons between ’85-’86 and ’88-’89. But arguably as important was the reality that the city had a true basketball superstar, one people from other places envied. 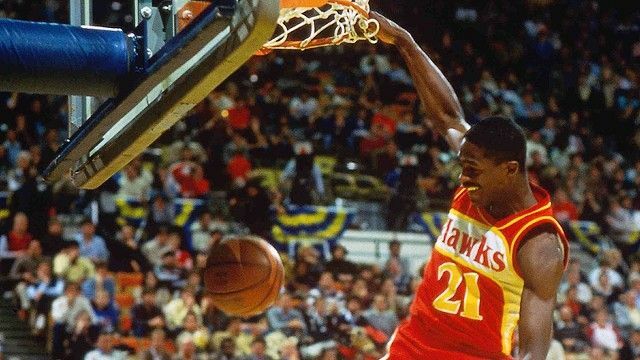 Wilkins was a true rival of Jordan, competed in five Dunk Contests, and is the recipient of one of the greatest basketball nicknames, the Human Highlight Film. 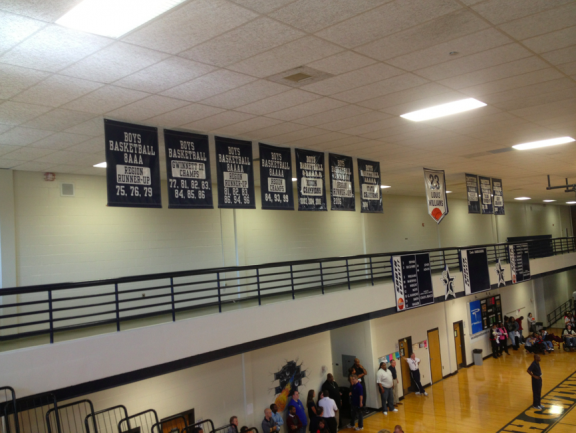 When you look up at the rafters, they suggest Dominique is the end of the Hawks’ happy story. Interestingly enough, however, even with a legendarily bad eight-year stretch last decade, ever since Dominique’s exit in 1994, the Hawks have actually been to the playoffs more often (11) than not (8). So why is the franchise so heavily associated with misery? And why haven’t people been coming to the games if the team’s doing more winning than losing? Why has the franchise dropped from 20th to 24th place league-wide in home attendance (89.4 percent to 81.2 percent) from 2009 to 2012, even though the team has posted similar middle-of-the-road playoff numbers? That is the greatest mystery when it comes to the Atlanta Hawks. What is it about them that has been so uncaptivating to outsiders and residents alike? It’s clear that it’s not simply winning or losing, so it must be something else. While it remains to be seen, after spending four days with the new team, one that barely resembles the 40-26, top-20 player-led playoff team from a year earlier, how could this be the Hawks lineup that captivates a city in a way it hasn’t since the days of ‘Nique? A combination of leadership, talent, fantastic timing, and a suddenly shockingly self-aware franchise helps to tell the story. In less than a month on the job, Danny Ferry, the Hawks’ new general manager, quickly became one of the most popular men in Atlanta. In one day, July 11, 2012, he spearheaded trades sending Marvin Williams and Joe Johnson out of Atlanta. In just six hours, he transformed the Hawks’ identity. Ding-dong, the witches are dead. As a suffering Atlanta sports fan first, journalist second, this was all I could think about as I followed the very tall and bald Ferry through the tunnels of Philips Arena. Trailing close behind, I watched as he signed a kid’s cast, took pictures with a family, and chatted up everyone we walked by. All told, it added four minutes to our journey, but eventually we made it to his office, a large, rectangular white room with a table, chairs, and a whiteboard wall filled with information that I wasn’t sure if I was supposed to see. “How can I ever repay you for this, God Danny?” I wanted to ask him. But I resisted the urge to congratulate him on shipping out Johnson and Williams. So I simply asked him why he took the job in the first place. OK, now it was time to talk about Trader Joe and Starvin Marvin. It was clear as I was rambling about the two ex-Hawks that Ferry wasn’t as attuned to how divisive they were, which initially surprised me. On one end, there’s Johnson, who (fairly or unfairly) reminded every fan of the six-year, $119 million contract he was absorbing with every missed shot, blank stare, dribble-spree, and first-round playoff loss. And then there’s Williams, who, through no fault of his own, was picked by the Hawks over Chris Paul, making fans weep over what could have been, while also further fueling the theory that when General William Tecumseh Sherman burned down Atlanta in 1864, he also cursed Atlanta sports teams for the next 600 years. Selfishly, I was disappointed that it wasn’t a vengeful decision. But then I quickly recognized that I was sitting across from a smart guy who understood the NBA, the Hawks franchise, and basketball in Atlanta, despite having moved into a local home just 10 days prior. As our talk progressed and we discussed more trade-related issues, it was clear he was more eager to talk about the players that he brought in. 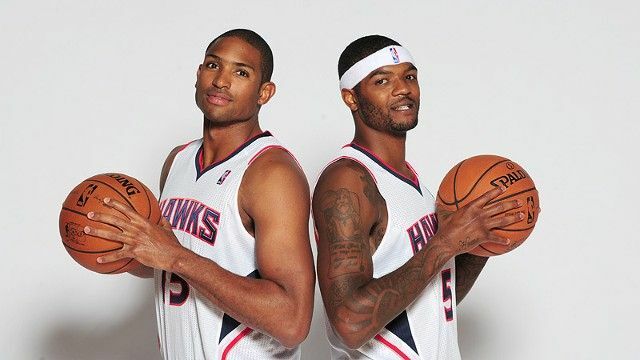 Through the Marvin trade, the Hawks got veteran point guard Devin Harris, and by way of Joe, 3-point specialist (and Georgia Tech alumnus) Anthony Morrow, NBA champion (and Abraham Lincoln Adam’s apple tattoo club member) DeShawn Stevenson, and a very tall Frenchman called Johan Petro. In addition, there’s the significant acquisition of Bulls sharpshooter Kyle Korver and Atlanta high school basketball legend turned ex-Sixers guard Lou Williams, along with the ex-Timberwolf forward Anthony Tolliver, a first-round draft pick in Vanderbilt’s John Jenkins, and a second-round draft pick in Virginia’s Mike Scott. And then, to round it all out, there’s Josh Smith, a healthy Al Horford, a slightly less healthy Jeff Teague, and an exactly-the-same Ivan Johnson. Oh, and Zaza. Mr. Pachulia can’t leave. Ever. That’s your 2012-13 Atlanta Hawks. It may sound insane, but I couldn’t be more excited to cheer for a basketball team. Seriously. Read that last paragraph again and internalize those names. On paper, it looks like a fantasy basketball autodraft gone wrong, but there’s a sense of mystery surrounding this collection of talent that has yet to be utilized properly. And after watching them practice, play, and interact with one another, it’s clear that they could actually be good. There’s a sense throughout the organization that, if they play a certain style of basketball, the Atlanta Hawks will be not only a dangerous team, but one people will want to watch. One thing the team certainly has going for them: They fully understand their situation. They know they’re weird, they know there are some things working against them, but there’s not the slightest sense, be it in practices, games, or in locker room chats, that they’re somehow going to underachieve. Not even close. As for the ghost of Joe, to whom everyone refers in a Voldermortian “he who shall not be named” sort of way? It’s too early to tell if their offensive attack truly benefits from him not being around, but they sure seem pleased with what they’ve gotten in exchange for his departure. Ignore the fourth line, if you will, and focus on the first three. 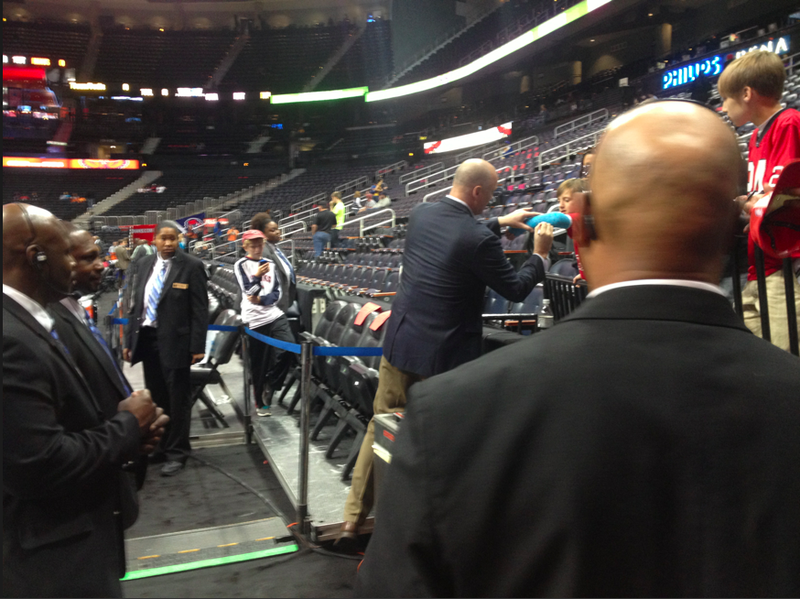 There’s a lot packaged in these lines, real emotions from Tauheed Epps, a true Atlanta native and sports fan. Every year I, too, wonder when the Braves are going to win it, even though in the back of my mind I expect something to go wrong at the last possible moment. And then there’s the Falcons, another team that has shown promise of late, but still hasn’t won a playoff game with Michael Vick’s replacement, Matt Ryan. The Braves coming up short and the Falcons folding under pressure. That’s my entire life. From 2000 to 2007, the Hawks finished 14th, 13th, 12th, 11th, 12th, 15th, 14th, and 13th in the Eastern Conference, with the ’04-’05 season serving as the absolute low point, finishing 13-69. Yes, the ’90s filled our hearts with playoff seasons, great characters, and good players (Mookie Blaylock, Dikembe Mutombo, Steve Smith), but almost a decade of misery afterward all but erased the joy. Then came the Joe Johnson era — the only player big enough to warrant a namesake since Dominique. He Who Shall Not Be Named was here for the final two sad seasons. He also led the team to five straight playoff appearances after that. Joe was good, but Joe wasn’t Nique. He was the anti-Nique. Instead of rivalries, spectacles, and nicknames, we got a guy named Joe. There was never a sense that he genuinely wanted to be in Atlanta, something residents almost irrationally demand from their public figures. And that personality, coupled with all that money and the good-but-not-good-enough success, created an atmosphere in which we quietly wanted him to fail, to miss shots, to not earn his money, just to prove that he was the cancer we’d always suspected. Now we enter a fourth era, the Danny Ferry era, if you will. Now, fans can start over. We have a new crew to invest in. It’s a chance to escape the history that haunts not just the players, but also us, the fans. Luckily for us, and the Hawks, there couldn’t be a better time in Atlanta. A tlanta doesn’t really have that unruly sports story. We never booed Santa Claus like Philadephia. We haven’t flipped cars after a big loss or started fires after a big win. We’re civil. We shrug our shoulders and move on. But then, in October, the Atlanta Braves trashed the field in the playoffs. Rarely have I been more proud of my city, and this is coming from a rule follower. But I was pleased to see that. I never wanted it to end. It was like the moment when the kid who gets picked on finally stands up to the bully and, somehow, wins the playground brawl. Or like an entire season of Made. It was fans finally getting their aggressive sea legs and showing their team that they’ve got their back (in the name of the worst call ever), even if it costs them a slice of their own dignity. It was easily one of my proudest moments as an Atlanta fan. That game took place at the end of the Braves’ season, as the Falcons sat at 4-0. Four weeks have gone by since then and now they’re 7-0. Undefeated, but getting little respect. I’ve been in Atlanta for multiple football Sundays this season, and while I’ve seen fans this excited about the Falcons before, I’ve never seen them as riled up about not getting respect. Yes, there’s still a level of unease with the undefeated record, because the Falcons being the best has never happened before, but the sheer nerve to not call us the best team in football is driving people mad in a way I’ve never witnessed. When the leader, the closest thing to a star on this team, admits that no one is standing out, it’s clear that this is an oddly egoless team. Things seem different, and it’s manifesting on and off the court. The Hawks easily defeated the Mavericks 110-94 in the preseason game I watched. The next morning, there was another practice, this time open to the public. Driving there, I was excited to see the players, especially the state Smith was in. After the game, he was clearly organizing a group in the locker room to hit Drake’s birthday party at the club Compound. (Assumption: confirmed.) I loved the idea not only of Josh & Co. hanging with Aubrey, but also coordinating rides like a varsity basketball team. This team wants to hang out together off the court. Arriving on time, this my third trip to Philips, I made my way comfortably into the arena, with a welcoming wave from the parking attendant, and found a seat near the court to observe a mic’d-up Larry Drew instructing his team through drills in front of a crowd of 2,000. Before I could find my seat, however, I saw Ferry walking my way and I remained standing, as if he’s the President or something. It was a warmer day, so a jacket wasn’t needed and I decided to wear a short-sleeved shirt. “Really? A Falcons shirt?” Ferry said, staring down at my lucky mesh Falcons shirt. It was Sunday, and that’s what I wear on Sundays. “It’s Sunday, there’s really no other option,” I shot back, realizing that I was now 0-for-2 on sportswear in front of the general manager of the Hawks. “It’s a bye week,” he said, laughing. He mentioned that somebody needed to get me some Hawks gear, and then kept on walking. The coach Drew–led practice was a serious one, complete with a full-speed scrimmage. Despite dealing with a team full of players still racing to learn a new system, I was amazed by the level of calm that he exhibited. Not a yeller, but not inaudible either — more like the high-expectation-having father who you never want to disappoint. Watching the players respond to him, however, during the closed shootaround, open practice, or a preseason game, it was clear Drew has had some help in making this team come together. His name is Josh Smith, he’s the clear leader of this team, and he is as important to the Atlanta Hawks as he ever has been. Every new player who I chatted with noted that Josh and Al Horford were instrumental in bonding the team, but Josh is far and away the more vocal of the two veterans. And he seems to know and welcome the fact that while his stat line alone will not be the deciding factor in wins and losses, the burden of making sure this team comes together is solely his. This wasn’t the Josh Smith I was expecting to meet, observe, and talk to. Based on his freak athleticism, tendency to jack up 3s without hesitation, and occasional tendency to let the game take over his emotions, I unfairly expected a personality mirroring a brash wide receiver or 100-meter sprinter. The team-building, smiley, introspective 26-year-old who uses the WNBA to illustrate different types of team configurations? (“They have one outstanding superstar in Tamika Catchings on the Fever, but to be honest with you, the Lynx shouldn’t have lost.”) Not so much. Whether his game will transform in the same way remains to be seen, but if this means he maintains his role as self-appointed, team-endorsed leader on the court, in and out of the clubhouse, then I’ll accept three roof-scraping jump shots a game. It was Tropical Tuesday at South Gwinnett High School on October 23. I knew that, because I was in the South Gwinnett High School gymnasium on October 23, surrounded by high school girls in hula skirts, high school boys in Hawaiian shirts, and teachers wearing leis. It had been eight years since I’d been on this campus, the last time being to watch Louis Williams play a high school basketball game. And now I was here because Lou wanted to give his old high school an opportunity to watch his new team practice. Let’s just say that it was a zoo. Lou was home, and many people, from the security guard to teachers to the principal to Lou’s mother, were grinning from ear to ear and telling stories as he practiced with his hometown team, in a gym where his jersey hung from the rafters. The gym was packed and loud. There were “oohs” and “ahhs” at the sight of anything fancier than a layup or a bounce pass. And when the scrimmage started, the energy only increased. Towels swinging, nonstop noise, unprompted cheering — yes, half the stand’s occupants were no older than 8 and the other half split time between paying attention and Tropical Tuesday flirting. But it genuinely felt as if the players were thriving off playing in this frenzied atmosphere, even if it wasn’t a real game. This is how I want Philips Arena to look and feel this year. They’re the underdog story, the Joe-less Hawks, two hometown heroes reunited and proudly playing for their city, the mysterious bunch of guys who seem to really like each other, the Danny Ferry–managed, Larry Drew–coached 2012-13 Atlanta Hawks. Watching this talented group come together in a short period of time, realizing that they must lean on each other for survival, and witnessing a city rally around that — this is the miracle that I believe can happen this year. Even if this team doesn’t shock the world, this is one of the few teams that I believe comes into Game 1 talented and makes the most drastic improvements en route to Game 82. As the scrimmage wound down, it was clear Lou was going to get the final shot. He hit a few deep 3s and threw down a breakaway dunk that got the crowd going. With his team down 45-46 with 30 seconds left, he had a chance to win it. If he did, I was probably going to rush the court and then get escorted from the premises, all while Danny Ferry shook his head at me in disgust. A Lou miss, into a Devin Harris–to–Mike Scott alley-oop, sealing the win for the other team. Josh Smith leaped off the bench, rapturously giving chest bumps. I loved everything about this. Every single thing. As I walked out of South Gwinnett High School, realizing that I’d have to drive about 90 miles per hour to make my flight on the other side of town, I was flagged down by a bus driver. She asked me what was going on in the gym. “Oh, the Hawks are having a practice in there,” I said to here, shuffling for my keys. “Oh, that’s nice, what for?” she responded. “Louis Williams, he plays for the Hawks now, he went to South Gwinnett,” I said to her, realizing that 95 mph would be my minimum speed limit. “Oh that sweet boy, I used to drive him to school. I’ve got to watch them this year,” she said to me, and then drove off.